Our design approach is driven by public and social engagement. With the advent of the internet and the reduction in book prices and audio books library’s have become less important. The brief for this competition allows us to rethink library’s and their ability as social centres to connect and bring people together. In this case on an urban furniture scale rather than and expensive building. With 75% of the world population moving to cities the rethinking of our amenity spaces has become crucial. 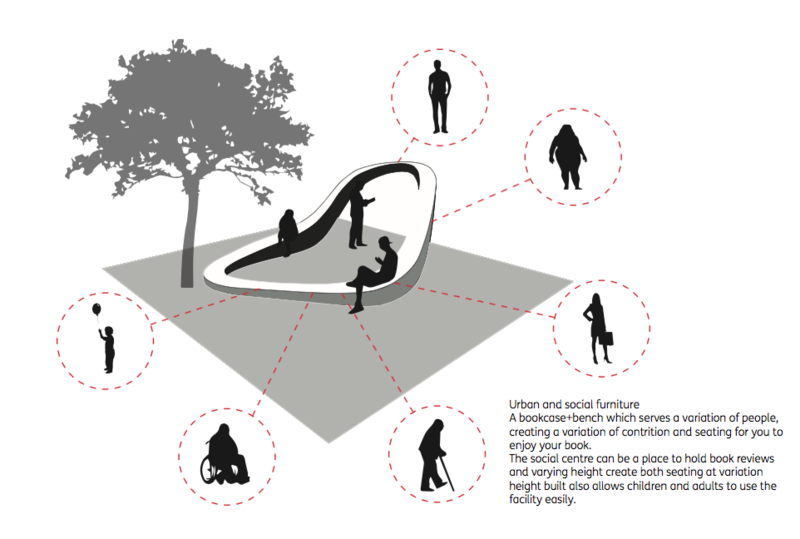 Our design is driven by the understanding that the Little library is more than a deposit for books, it is a crucial piece of social and urban infrastructure which will enable people to connect and will create a sense of community. 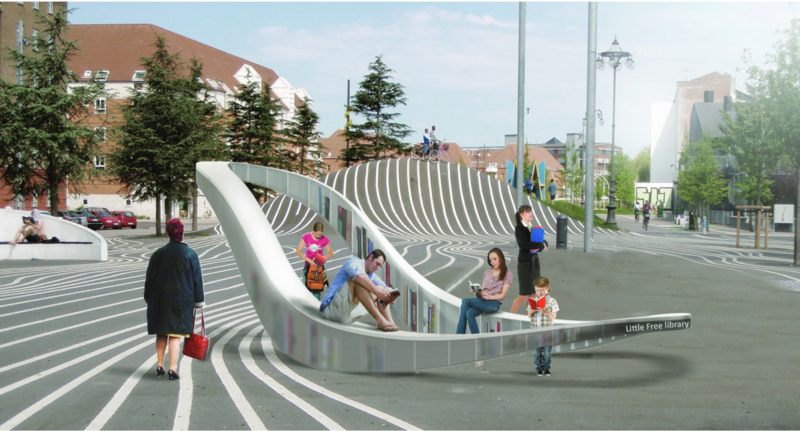 Our proposal seeks to combine the ordinary park bench with the bookcase, elegant and highly designed this combination will become a prominent feature with the city bringing the community and neighbourhood together. Our proposal attempts to do this through a number of simple feature. The Ribbon element is driven by the need to create an urban feature, the circle creates outward and inward looking spaces , creating ample advertisement space on the outer edge as well a large volume to carry books in the interior. The interior space frames the library and allows for much more social engagement as well events such as book reading to take place. In addition the circular geometry which has been adapted by lifting at one edge to create and entrance allows the library to overcome one of the major flaws with previous proposals, the varying height across the library means that the books are easily accessible by children and adults at the same time, disabled and abled body at the same time, our proposal seeks to create a variation of condition which cater for a variation of people, an alternative and deliberate counterpoint to one size fits all. In most book cases, material is used to display books, in our proposal we feel that the books should ply a more substantial role, so the geometry of the ribbon is such that it increases in volume towards to centre which means more books will be stored here creating a higher mass and insuring the stability of the ribbon, in other words the books are structural stabilisers in our library and play an active role. The ribbon itself is lightweight and made of recycled plastic which will decrease material costs. Light and easy to assemble it also means that it can be moved and reassembled in short spaces of time. to use recycled plastic bottles reduced to raw material to construct the ribbon library. We would seek neighbourhoods to contribute the plastic which means they would take some ownership of the creation of the library, once enough plastic has been donated by the neighbourhood they will be rewarded with this highly crafted and engineered design which will allow them to share books. In this way the community has a stake and is rewarded with the library for the contribution. Insuring that our library goes beyond and creates a culture of sustainability with in the community.